South Park Episode 102 - "Weight Gain 4000"
Weight Gain 4000 is the second episode of the first season of the animated television series South Park. It originally aired on Comedy Central in the United States on August 20, 1997. 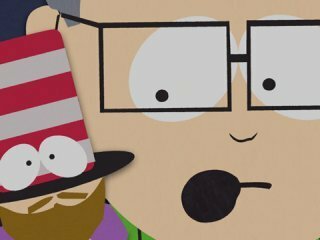 In the episode, the residents of South Park excitedly prepare for a visit by celebrity Kathie Lee Gifford, whom Mr. Garrison plans to assassinate because of a childhood grudge. 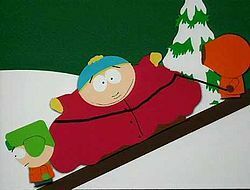 In the meantime, Cartman becomes explosively obese after buying Weight Gain 4000, a bodybuilding supplement. Mr. Garrison starts the day off with a special announcement; one of South Park's own has won a national essay contest. Everyone is shocked to learn that the winner is Cartman, who doesn't even remember what he wrote about.